Laser scanning technology and expertise are needed in space. In recent American Surveyor article FINESSE Exploration Strategies using High-Resolution LiDAR Surveying LiDAR instruments and surveying techniques are considered integral tools in the future exploration of planets. Today NASA’s Solar System Exploration Research Virtual Institute (SSERVI) Field Investigations to Enable Solar System Science and Exploration (FINESSE) program’s exploration strategies are being developed using Tripod and Mobile LiDAR instruments. Due to the extremely high costs of visiting and exploring objects in space, such as the Moon, Mars and other planets, it is crucial to find the right tools and techniques for collecting high-quality data for research. This can be done by making experiments in comparable places on Earth. The FINESSE scientists have been exploring the Craters of the Moon National Monument and Preserve (CRMO) in the Snake River Plain of Idaho. 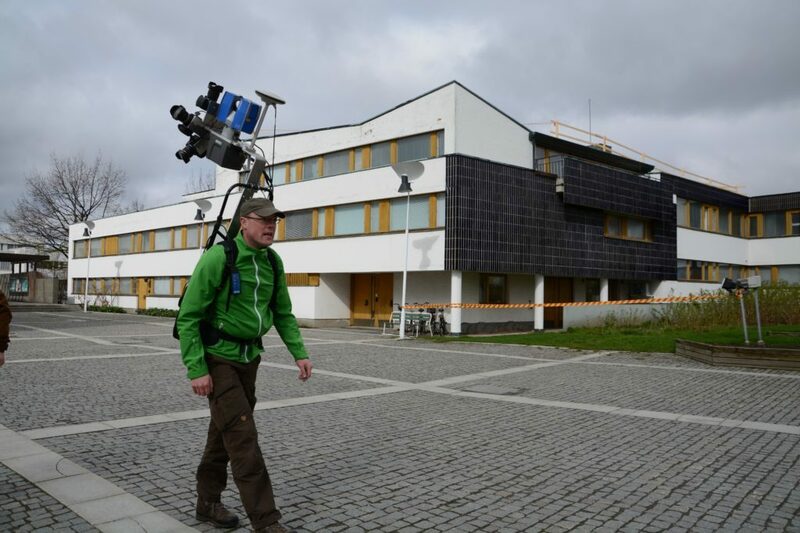 As a part of the cooperation CoE-LaSR research professor Antero Kukko has been performing technology demonstrations using an FGI originating backpack mobile laser scanning system Akhka-R3. 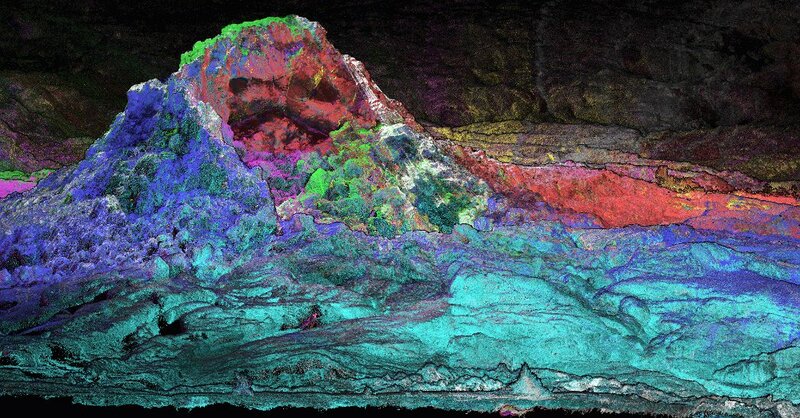 In a lava field environment the Lidar detects details often more precise than 1 cm point distribution revealing even tiny details of the surface. The collected data enables the producing of high-accuracy topographic maps and provides information on terrain roughness and morphology features of the surveyed area. The Backpack system developed in FGI has proven to be an efficient tool for fast collection of precise information in lava fields. The findings indicate that in similar conditions, i.e. in Mars, terrestrial and mobile laser scanning are good options for collecting data for further analogy and exploration studies. The FINESSE program is a consortium of more than 30 research scientists. Their goal is to generate strategic knowledge in preparation for the human and robotic exploration of the Moon, near-Earth asteroids (NEAs) and Phobos & Deimos. Laser scanning research got recognition among the international media in 2016. Our “sleeping trees” findings and advances in mobile laser scanning gained international audiences both in scientific journals and popular news. Two articles by CoE -LaSR researchers were in the top 10 of GIM International magazine’s most read articles 2016, and a Coe – LaSR cooperation article on birch tree’s day-night cycles was listed as one of the 12 best science stories of the year by The New Scientist. The articles in GIM International brought insight into topics of personal laser scanners (PLS) and unmanned aerial systems (UAS). The main interest and focus was on the development of new scanning systems and potential applications utilizing them in 3D data collection. GIM readers appreciated Kukko’s, Kaartinen’s and Virtanen’s insights into the advantages of personal laser scanners (PLS) such as Akhka R2 PLS in mapping complex environments presented in the article Laser Scanner in a Backpack – The Evolution towards All-terrain Personal Laser Scanners in GIM International 15/02/2016. Backpack system allows data acquisition in environments, which have before been hard, or even impossible, to reach with “conventional” wheeled mobile laser scanning systems (MLS). To our knowledge, the Akhka PLS system has been the first backpack system with such high data acquisition capability. After the publication of this article, an updated revision, AkhkaR3, has been released with even higher performance sensors. The current possibilities and future opportunities for using new and more cost-effective laser scanning methods were discussed in the article The Current State of the Art in UAS-based Laser Scanning – Airborne Laser Scanning with a UAS by Kukko, Jaakkola and Hyyppä. The article gives an overview of different types of UASs, both current and emerging laser scanners and UAS laser scanning applications. The New Scientist story ’Trees seen resting branches while ‘asleep’ for the first time‘ illustrated a novel application of using the high potential of terrestrial laser scanning measurements in the field of chronobiology. The study, a joint international research collaboration with Dr. Eetu Puttonen from NLS FGI and TU Wien, clearly demonstrated circadian movements of silver birch branches and showed for the first time that lidar measurements can detect nocturnal physical changes in trees that resemble a resting or a sleeping pattern. Above: Overnight movement of a small tree acquired with three different terrestrial laser scanners. Each frame represents the point clouds measured at the shown time with color. The point coloring shows the reflectance of each measured point that were calibrated using an external calibration target. The black point cloud shows the tree’s original posture at sunset. The results were exciting as they support the use of high resolution terrestrial laser scanning in monitoring plant dynamics with short time intervals and in a non-destructive manner. 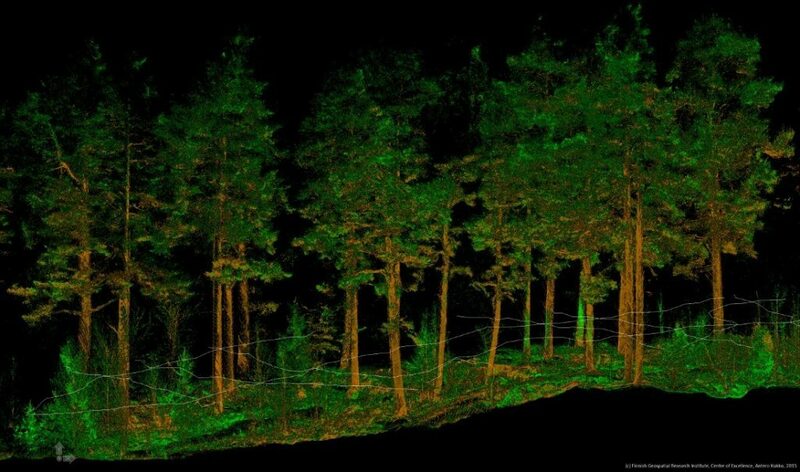 Additionally, the laser scanning measurements can be scaled up to cover for example several full-grown trees of different species simultaneously with short preparation times. Personal mobile mapping on a backpack (PLS) is a novel innovation from FGI. The application uses various technologies: GNSS-IMU positioning, laser scanning, digital photography and data driven algorithms for improving the positioning in often GNSS denied urban space. PLS allows rapid data collection of complex environment without compromising the data coverage, precision and accuracy of data. The approach is a flexible solution for varied situations and mapping tasks in urban space, and applicable to e.g. building façade reconstruction, street mapping, urban arboculture and change detection. The research aims at development of modern surveying practices, investigates alternative system and sensor layouts and performance related issues as well as formulates automated data processes for 3D modeling and seeks for methods for improving geometric quality of data and data fusion. Above: 3D geometry and imagery are collected simultaneously using backpack PLS providing an efficient tool for urban mapping. 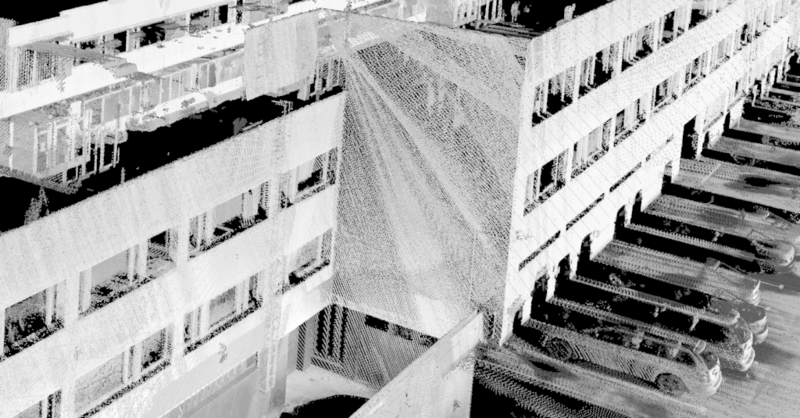 Above: Point cloud data collected with backpack PLS captures building geometry fast in high details and accuracy. © Copyright , Centre of Excellence in Laser Scanning Research. 2019 © Centre of Excellence in Laser Scanning Research. Crafted with love by SiteOrigin.